My husband and I don’t generally do much for Valentine’s Day. We consider it a made-up, commercial holiday, and we don’t need a special day of the year to express our love for each other. However, this year my two Dorie groups presented the perfect excuse to make a fancy dinner to “celebrate” the holiday. I will tell you about the main dish on Friday. Today we will discuss the dessert I made: Marquise au Chocolat. This was the Tuesdays with Dorie dessert for last week (I’m posting a week late since I saved it for Valentine’s Day). 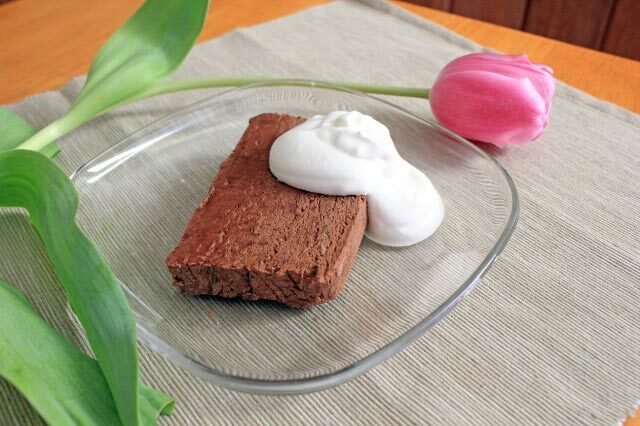 Marquise au Chocolat can be described in three words: frozen chocolate mousse. It truly is chocolate mousse packed into a loaf pan and frozen. It is sliced just before serving. The end result is a dense, almost fudgy, chocolatey treat. I loved pretty much everything about Marquise au Chocolat. The flavor and texture are wonderful. I love that you can make it ahead – perfect for a dinner party. This dessert was a big hit with my husband. 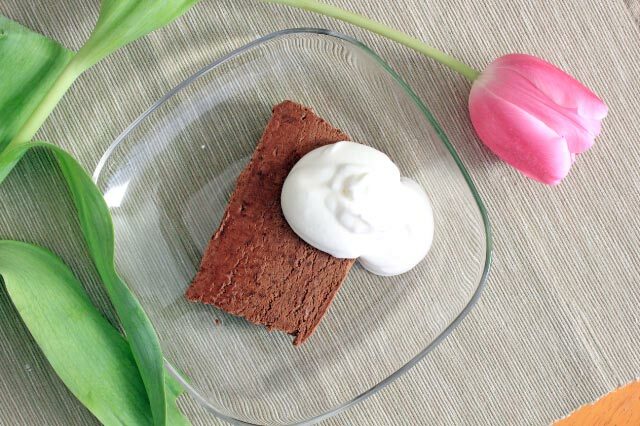 All of his favorite desserts include the words “chocolate” and “mousse”, so I think this will go down as being one of his favorites from Baking Chez Moi. Looks beautiful and I love your photo. Hubby opinions count at my house too! Such a pretty presentation. This has perfect written all over it. Quick, easy, and delicious, not to mention, can be made ahead. Works for me! Lovely presentation on this! That tulip is so pretty. I am not the biggest chocolate fan, but my chocolate lovers really enjoyed this one.